Michael Williams is a lecturer in Diagnostic Radiography in the School of Health and Social Care. He specialises in Radiographic MSK Reporting with interests in major trauma and anatomy. He spent 10 years working at The Royal London Hospital, part of Bart’s Health NHS Trust, as a Senior Radiographer and Practice Education Facilitator for Diagnostic Imaging before joining LSBU in 2018, where he had originally studied his post graduate radiographic reporting qualifications. Michael worked as the Practice Education Facilitator with his previous employer organising post graduate education and continuous professional development teaching of his colleagues. 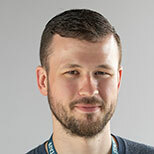 Michael has guest lectured at City, University of London during his time as a practicing Radiographer and in 2017 joined LSBU’s Diagnostic Radiography Associate Clinical Faculty where he taught numerous practical sessions with the undergraduate students, further encouraging his career here at LSBU. Michael is registered with the Health and Care Professions Council and is a member of the Society and College of Radiographers with whom he previously trained and acted as a Union Learning Representative.